It’s been a while since we wrote about updates to Two Tap, but here’s a big one. We’ve found a significant percentage of our users forgot their Two Tap password by the time they encountered our shopping cart the second time. Using a two tap buying process seems difficult if you can’t really access your wallet. We’re now linking a customer’s payment credentials to their telephone number. Problem solved, there’s no password to remember. 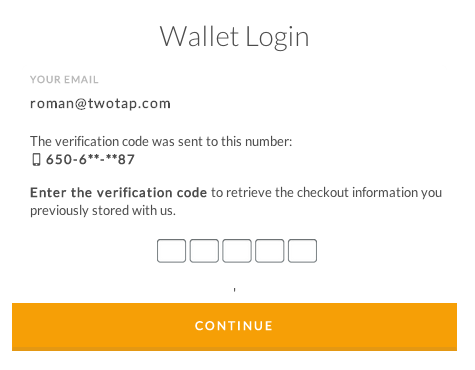 In our recent update, as soon as a visitor enters their email address in the form a unique pin code is sent to their phone if they’re an existing user. That’s used to pull up the wallet info. It’s also secure, as in order for someone to order with your wallet they would need access to both your phone (you are using a security code on it, right?) AND your CCV code for the stored payment option. Order any product online by entering your email address, a 5 digit pin and your CCV code? Sweet! Honey launched their 2.0 product and we were so caught up with work that we forgot to give a shout out to the great team at Honey. Honey 2.0 takes the beloved product further to integrate a universal shopping cart powered by Two Tap. The deep integration also automatically applies discounts to shopping where codes are available from Honey’s database. There’s a lot we could say but Sarah Perez recently reviewed it in TechCrunch and called the product a no-brainer twice, check for yourselves. We just want to send our congrats to the great team at Honey for pulling off a great product!